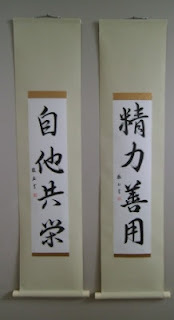 These scrolls are a pairing for a dojo back East. Using the lighter cloth has a less ominous feel than many of the scrolls I have made for Dojos lately. Which is a good thing considering the meaning of the works. These are the creeds for Judo. Jita Kyouei (Left) and Seiryoku Zenyou (Right). They mean Mutual Welfare and Benefit and Maximum Efficiency Minimum Effort.. Readers can learn more at this wikipedia link on Judo. This was Yoshimi's Kakizome no Hi or New Years Day writing for 2012. 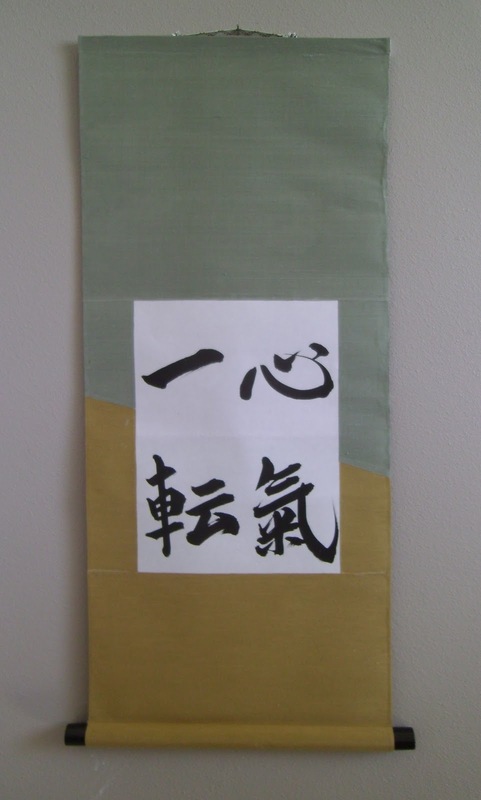 It reads 心気一転 Shinki Itten which means to Turn Over a New Leaf. I thought it was very appropriate for New Years. This is probably a new scroll style for some, but the two-tone has been around for many years in Japan. As a result of this phrase, I decided to try something a little different and put the cloths with the Hashira at a diaganol. This is turning over a new leaf for me in trying something new and being able to have it work. I did have a little bit of trouble with the mimiori on this scroll, but it still turned out OK. 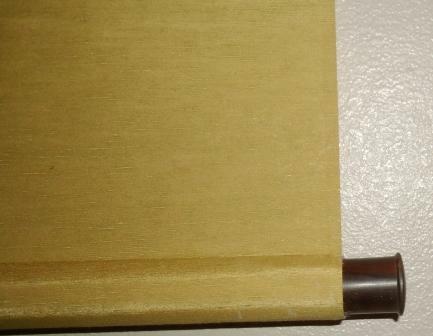 The upper cloth is a Teal and the lower is a goldenrod. It is in the Fukuro Hyougu style with no Ichimonji. I worked hard on a larger piece of artwork, but the scroll did not work out. It was ruined in the final process. But the lemons are lemonade, because I think this is a more appropriate scroll to use for a bonsai display. It is still a little on the big side, but with a larger tree should work in a display environment well. The sumie artwork was done by very talented Polish artist Mariusz Szmerdt. He has done several works for me, and I hope he felt that he got his money's worth. The cloudy moon is detailed, yet faint at the same time. I used the silver cloth with the large flower Karakusa (arabesque) pattern for two reasons. b. 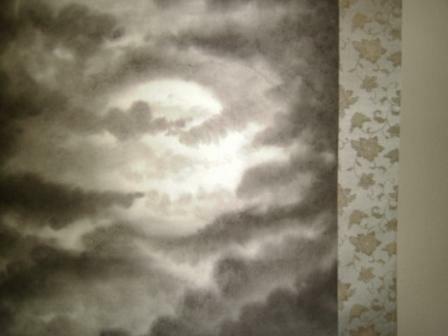 To encourage the viewer to feel the moonlight is completely enveloping them as well. The style of the scroll is a Nidan Hyougu which is a Semi-formal scroll, and it should go well with any type of plant with which it is displayed. The Ten and Chi portion is a Golden to be neutral and allow for either a summer or fall themed display. One thing viewers will notice missing is the Ichimonji (cloth) bordering the top and bottom of the artwork. I chose to do it in the Nidan Hyougu (Two Step) style, because it is the most informal of the Semi-formal scrolls, and would allow flexibility to be used with any type of tree or plant. It is finished with a Nezumi (mouse color) kakehimo to go along with the silver Chuumawashi and an Enshu Kokutan 遠州黒檀 jikusaki. The Enshu Kokutan has a little flare and lip on the outer edge which provides a subtle, old feel to the scroll.